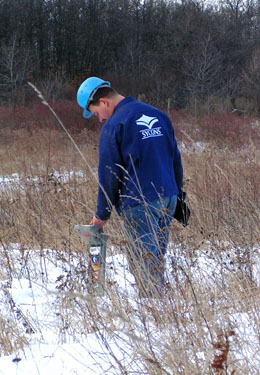 It is a quick and efficient trenchless technology to install new utility lines. The technology is especially advantageous in case of HDPE pipeline construction under roads with important traffic, or under railways, as traffic deviation or roadblocks are not required. The technology consists of the following steps: firstly a so-called pilot hole is drilled along the designed path of the pipeline, using radio probe control and high-pressure slurry injection. The pilot hole starts from the ground level and follows the path of the utility pipeline to be installed, and finally, at the end returns to the ground level again. The drilling head arrived to the exit point is replaced by a so-called extension head, the diameter of which depends on the diameter of the pipeline to be installed. The HDPE pipe to be installed is mounted on this extension head, then it is pulled through the extended pilot hole. We use environment-friendly drilling slurry both for the pilot hole drilling and the pipeline pulling phases. 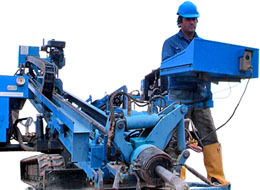 When drilling the pilot hole of the horizontal directional drilling drive, a radio probe emitter is installed in the drilling head. By the help of this emitter, and a receiver on the surface, the depth and position of the drilling head is known and can be controlled during the whole drilling process: this explains the name of “directional” drilling. We construct HDPE pipes between Ø90 and Ø300 mm, in drive lengths of 100-150 m, up to 14 m of depth. An important benefit of this technology is that no launch shaft is necessary for the pipeline installation, and multiple pipelines can be installed on the same path. By using horizontal directional drilling technology, posterior deep drains, cellar drains, drilled drains and gravitational drainage systems with vertical gravel bodies can also be constructed beside the pipeline rehabilitation projects.